The BLAST III cruise was conducted between February 22nd and April 07th, 1996 and took our crew from McMurdo, Antarctica, along the coast and through the ice of Antarctica to Punta Arenas, Chile. This cruise was a continuation of our previous BLAST cruises. The main focus on these expeditions has been the measurement of methyl bromide and a suite of other methyl halides, very similar to the setup during BLAST II. As the cruise was leading us into cold, productive waters at the end of the austral summer, we tried to either verify or refute the outcome of some recently published atmospheric models that predict this type of oceanic regime to be a major source for atmospheric methyl bromide. Despite the undersaturations that we found in the open oceans on BLAST I and II, these models predicted supersaturations on the order of hundreds of percent in cold waters. As oceanic degradation due to hydrolysis and nucleophilic displacement is naturally supressed (low temperatures), the high biological productivity observed in those areas were thought to cause high levels of methyl bromide to be released to the atmosphere. The results of this cruise show large undersaturations of methyl bromide, indicating that polar oceans - and, hence, the global oceans - are a net sink for atmospheric methyl bromide. Those results were published in January, 1997, see publications list. Shari and Jürgen in front of our home lab. The Nathanial Palmer is operated by Antarctic Support Associates, which headquarters is located in Englewood, Colorado. Look up their site to learn more about the Nathanial Palmer and ASA activities. 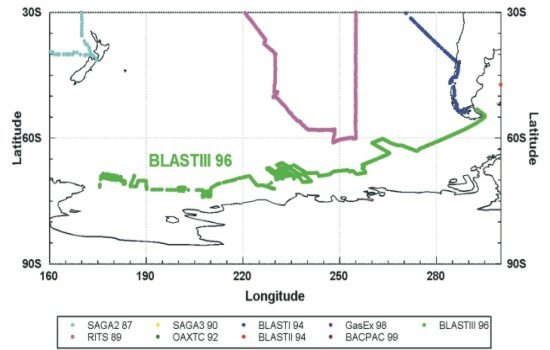 BLAST III is shown in green in the Southern Ocean, out of Antarctica and into southern Chile. Undersaturations of CH3Br in the Southern Ocean, J.M. Lobert, S.A. Yvon-Lewis, J.H. Butler, S.A. Montzka, and R.C. Myers, Geophys. Res. Lett., 24(2), 171-172 (1997). General position and meteorological data as well as methyl bromide data are available from our public FTP site at ftp.cmdl.noaa.gov, subdir /hats/ocean/blast_iii.